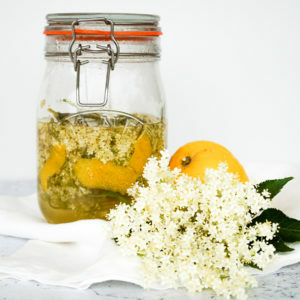 Put the heads of Elderflowers with the paired lemon into a wide mouth jar and poured the boiling water over the top and allowed it to steep and cool for 20 min. Strained and reserve the liquid. Add the sugar and mixed it well, add the cider apple vinegar and stir. Place in the fridge for 24 hours. After chilling, filled a glass a 1/4 full of Elderflower Scrub and finished the rest with cold sparkeling water. When a shrub is freshly brewed, it possess a strong taste of vinegar. However, with time, all of a shrub's harsh vinegar edges round out and meld with the syrup to make the perfect hybrid of sweet and sour.